Our tour guide Khalid and driver Dinesh started our day at our hotel on New Delhi at 3am. What seems like an early hour was the best time to travel from Delhi due to traffic but also to arrive at the Taj Mahal when it is least crowded and as cool as it can be for a warm place. 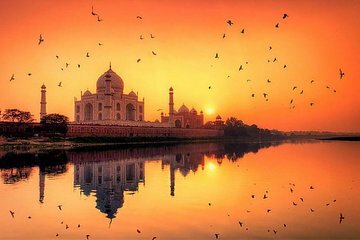 The Taj Mahal is a true wonder of the world. I was amazed with the beauty of the whole site. The history provided by Khalid was tempered to my interest in the history, his mastery of the history exceeded my interest in all areas but was very deep in the areas I cared for. It was great to get such information tailored to my interests. Khalid took the most amazing pictures knowing what to take and create some great poses. His knowledge in this area is at a masters level. Dinesh our driver took great care and caution in the drive and stopped as frequently as we asked for rest breaks. Outstanding! The Taj tour was included with our itinerary by Taj Trip, they did an outstanding job from start to finish, we were truly pampered every step of the way!! The Taj Mahal was even more magnificent in person. I was so moved by the love for and memory of Mumtaz by her husband and the beauty of the Taj, it all brought tears to my eyes. I never thought I'd be there in person. Our guide, Shan, really brought the story to life and our driver, Gopol, could not have been more skilled at navigating the traffic and keeping us hydrated with lots of nice cool water. Much appreciated!! Agra Fort is not to be missed, again, Shawn brought history to life, my daughter was fascinated. Mak with Taj Trip made the arrangements for us it was so nice to have a friendly contact in India. It truly was the experience of a lifetime! Thank you so much!! They created the trip of a lifetime for us, we loved it! !